Annual Spring Plant Sale offers a wide array of organically grown selections for the gardener and landscaper. 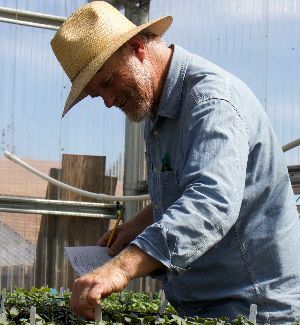 Garden manager Christof Bernau inspects plants being grown at the CASFS/UCSC Farm's greenhouses for the annual Spring Plant Sale. Photo by Brianna Gaffney. Perennials being readied for the annual Spring Plant Sale, taking place at the Barn Theater on April 28 and 29. Photo by Brianna Gaffney. 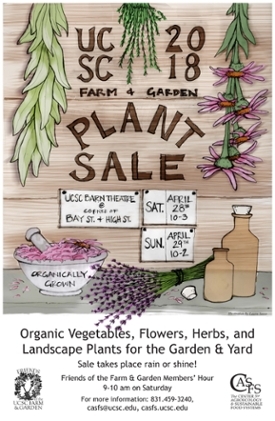 The UCSC Farm & Garden’s annual Spring Plant Sale welcomes gardeners with the region’s largest offering of organically grown vegetable, herb, and flower starts, along with a wide variety of landscape plants. The Spring Plant Sale takes place Saturday, April 28 and Sunday, April 29, in the Barn Theater parking lot at the base of the UC Santa Cruz campus, near the intersection of Bay and High Streets. The sale will be open on Saturday from 10 a.m. to 3 p.m., and on Sunday from 10 a.m. to 2 p.m. On Saturday, members of the Friends of the Farm & Garden can enjoy a “members’ hour” starting at 9 a.m. (new memberships and renewals are available starting at 8:30 a.m.). For vegetable growers, this year’s sale will feature a selection of more than two dozen heirloom, slicing, and paste tomato varieties, a wide range of sweet, hot, and specialty peppers, lots of lettuces and salad mixes, including green and red butter, romaine, and specialty types, and an assortment of eggplants, Asian greens, broccoli, cabbage, cauliflower, summer and winter squashes, pumpkins, leeks, cucumbers, kale, and more. Culinary and medicinal herbs are also featured at this year’s sale, with 10 tempting varieties of basil on offer, along with fennel, parsley, oregano, thyme, bay laurel, marjoram, catmint, and Echinacea. Flower lovers can choose from an array of annuals perfect for homegrown bouquets and landscape plantings. This year’s offerings include asters, bachelor’s buttons, cosmos, hollyhocks, stock, tithonia, zinnias, and sunflower varieties. Also available are particularly water-thrifty options, including amaranth, three varieties of California poppies, marigolds, statice, strawflowers, and cosmos. Popular landscape plants include a selection of salvia, lavender, and sage varieties. Look for butterfly bush, delphiniums, columbine, coral bells, Ribes, along with kangaroo paws and irises. Many of the perennials will be priced at a special rate of 3 for $21 in gallon containers. You can find a full list of plants available at this year’s sale on the CASFS Events website. Look for the Plant Sale listing. If you'd like to join the Friends of the Farm & Garden or renew your membership prior to the sale, click here to access the secure online membership form. 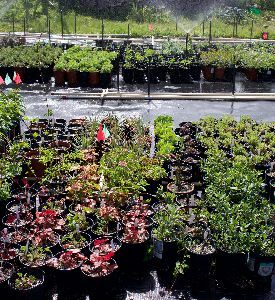 Spring Plant Sale proceeds help support the operation of the UCSC Farm & Garden and the Apprenticeship in Ecological Horticulture, a six-month training course in organic farming and gardening. Members of the Friends of the UCSC Farm & Garden receive a 10% discount on purchases. Cash and checks only please. For more information about the Spring Plant Sale or the Friends of the UCSC Farm & Garden, call (831) 459-3240, or send email to casfs@ucsc.edu.